But it's not about perfection, and that's one of the most important things I've learned so far on this meditation journey. Here are five more lessons I've learned along the way. My 50-day meditation streak, happily quantified by the Calm app. Like so many of us, I'm an overthinker. My mind whirrs mercilessly, day and night. Therefore, for years I've been saying, "I really should start meditating." I "knew" it would benefit me, but the thought of trying to get rid of my thoughts for 20 minutes a day was far too daunting. So I never really made much of an effort. Then, a couple of months ago, I was reading Kelly McGonigal's excellent book, The Willpower Instinct. In it, she states: "Just three hours of meditation practice led to improved attention and self-control. After eleven hours, researchers could see those changes in the brain." And: "Another study found that eight weeks of daily meditation practice led to increased self-awareness in everyday life, as well as increased gray matter in corresponding areas of the brain." Improved attention and self control? Increased self-awareness and gray matter? Who wouldn't want these results? At the same time, I'd recently become reacquainted with the Calm meditation app I'd downloaded a year or more ago. With mind whirring, I decided to give meditation another try. I meditated sporadically for a while before attempting a long meditation streak. Having finally committed to trying something longer, I've just reached the 50-day mark, meditating every day for the last 50 days. One thing I know for sure is that every day is different. Some days I feel like I'm becoming a meditation professional; other days, I'm lucky if I have 10 "good" seconds in a 10-minute meditation. 1. Five minutes is enough. This is not the first time I've tried meditation, but it's definitely the first time I've had much success. I'd say quite possibly the number one reason I never succeeded before is because I always thought I had to do at least 20 minutes a day for it to "work" (whatever that might mean). But then one day I was looking through the timed options on the Calm app, and there they were: options not just for 20 minutes, an hour, eight hours, but also ... 10 minutes. Five minutes. One minute. Wait, I thought. If those are options included in the app, does that mean a five-minute meditation is ... acceptable? So I started with five minutes. And that, I believe, has made all the difference. Would I have had greater or quicker "results" (whatever that might mean) from doing longer meditations? Highly possible. Would I have stayed with it for 50 days if I'd started out trying to do 20 minutes a day? I wouldn't have lasted a week. No, five minutes was enough. I wasn't meditating so much as I was building a practice, a habit. I needed to start with something I simply could not justify not doing. After maybe a month, I finally had formed enough of a habit that I decided to change it up: three 5-minute sessions a day, morning, noonish, and night. One benefit of this schedule is that it refocuses me throughout the day. Another benefit is that if I miss a session, I still have at least one or two short sessions completed. 2. There's no "right" or "wrong" way to do it. Oh, I'm sure some hard-core meditators might disagree with me here, but one thing I told myself when I started this effort was that the effort, in and of itself, was the goal. I don't worry about "right" or "wrong." When people find out I'm meditating, they always ask how I do it. Sometimes, if I'm feeling worried or anxious or upset about an interaction, for example, I'll focus on whatever positive affirmation will provide a counterbalance to the day. Other times, if my brain is whirring along at a million miles an hour, I'll spend my time letting thoughts float by, working to clear my mind and focusing on the app's nature sounds. (I'm partial to the Calm app's "Foggy Stream" scene, which has enough birds chirping and water running to help keep my mind on the meditation rather than all my other thoughts.) When I meditate three times in a day, I try to have at least one session be a "clear mind" session (focusing on letting go of thoughts), but I have firmly told myself there is no wrong way. This "no judgment" mindset is especially important when the specter of comparison appears. The Calm Twitter account will often retweet people's tweets in which they share their streaks. Once, I saw a guy who had a 100-day streak. His total number of hours meditated for a 100-day streak was several times what mine will be when I get there. For a moment I thought, "I could just set the app to run for two hours while I do something else..." But that would be pointless. It's not a competition. It's life, it's a habit. There's no judgment. Do what works for you. Each day when I finish the first meditation of the day, the Calm app puts a lovely bright green dot on my calendar. It may seem silly, but when I began, just knowing I would get a new dot on my meditation streak calendar was enough incentive to get me started each new day (especially since I knew I only had to do five minutes). 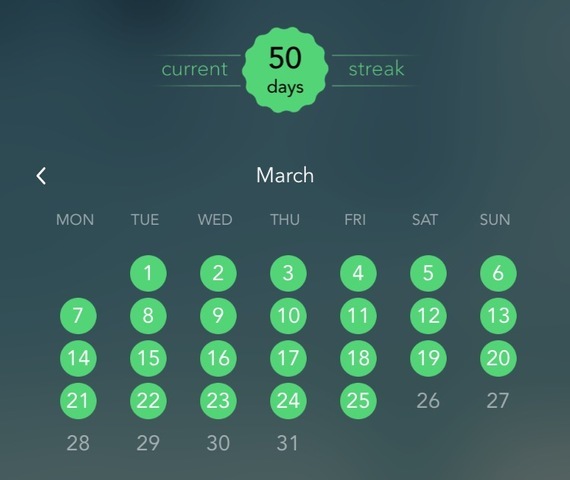 My 50-day streak started on February 5, but that's not the day I started meditating. In fact, I tried the Calm app long ago, but didn't stick with it. Last December I started using it again, on and off, but I didn't log in to the app, and so it didn't record my progress. It wasn't until late January that I finally logged in and started getting the little green reward dots. I did pretty well at the end of January, but I skipped February 4 before picking it up again. As I went on, day after day, seeing that naked little 4 on the calendar, no green reward dot surrounding it, made me realize that if I'd just done five minutes that day I could have had a "perfect" month. Did "perfection" matter? Not really. On the other hand, it made me happy, those little green dots. Even more motivating is the fact that the app keeps track of how many days in a row I've meditated--e.g. a 50-day streak. (I assume most meditation apps have a similar feature. If you're using another meditation app, please feel free to let us know in the comments how it works.) Every day, the number climbs, and all I have to do is sit still for five minutes, letting go of thoughts. As accomplishments go, it's a pretty easy one to earn! Now, you might ask, did the desire for a reward lead to the temptation to cheat? I'll admit it: Yes, on occasion, yes it did. Somewhere around the 10- to 20-day-streak range, I probably was tempted two or three times to just turn on the app and let it run without my actually meditating. It's at that point that the importance of setting a smaller, manageable five-minute goal became clear. "Come on, Pam," I'd tell myself. "Five minutes. It is ridiculous to cheat to get a reward when all it takes is five minutes." And that worked. Every time, I just gave in and did the five minutes. I didn't cheat once, and now I no longer even want to. As is the case with so many people, my brain feels sometimes like it's going non-stop. The moments in meditation where I actually manage to get my brain clear are most often followed by, "Oh look! My brain is clear! I'm doing such a great job! ..." and then off I'll go, drafting an email or an article or thinking about who I need to call, before realizing that moment of clarity was quite brief and is now long gone. It's okay. I just bring my brain back (the sensation is almost physical, the halting of thoughts), and try again. The proof is in the pudding: about five weeks into my 50-day streak I was sitting in my living room, not meditating. As happens all the time, a worrying thought started to seep into my head. And do you know what happened? I let the thought go. Just like I practice all the time in meditation! I let the worrying thought go! I'd love to say I've managed to do that every time since, but I haven't. But the thing is, there is hope. 5. "Showing up" is a core value. I've done enough of this self-work that if you'd asked me any time over the the last few years to list my core values, I could have easily rattled them off: courage, connection, compassion. Quite unexpectedly, though, through meditation, and more specifically through thinking about what I've learned from meditation, I've recognized another core value: showing up. I say all the time that people worry too much about "doing it right" and not enough about whether they're doing it at all. Turns out the same is true with meditation. Just as in life, it's not about "getting it right." No, it's about showing up and putting in the time, making the effort, day in and day out. Recognizing showing up as a core value was a truly powerful realization, and it is providing me with another guiding star. I'm not concerned with perfection, either in meditation or in life. What I want to know, whether at the end of my life of the end of my day, is, did I show up? In my life and in my relationships, for myself and for others? Was I there, in the game, in the arena, on the field? I may not come in first. I may fall; I may be bruised and battered. I may play to an empty house. I may say the wrong thing, do the wrong thing, look like a fool, feel like an idiot. I may have 10 seconds of clarity in a 10-minute meditation. But was I there, making the effort? The seeds of this core value can be seen in the Personal Manifesto I created for myself a few years ago, which includes the phrases, "There's no such thing as bad dancing, so long as you're dancing," and "You don't have to know the exact path to or location of your dream. You just have to start walking." I'd never worded it as simply as "show up," but that's pretty much what it comes down to. Having crystalized the core value of showing up reminds me to look at everyday life through the same lens. "Did I win a Pulitzer, write the best book ever written, sell billions of copies? No. Did I write some good books that many people have enjoyed? Yes. And did I have fun, and learn, and grow from it? Absolutely yes." So. Do I have it all figured out now? Definitely not, and I doubt you'll ever hear me claim that I do. But I'm getting the hang of meditation, and I'm starting to even crave it. I'm seeing other emerging trends, as well, positive and exciting potential trends and benefits. It's too soon now to talk about them, but come back in 50 more days for my 100-day report! Some notes on apps: I use the free version of the Calm app, but there are several apps out there for both phone and desktop. A lot of people use Headspace or other apps. Most apps have free trials, as well as free versions post-trial. I recommend trying out several to see what works for you!